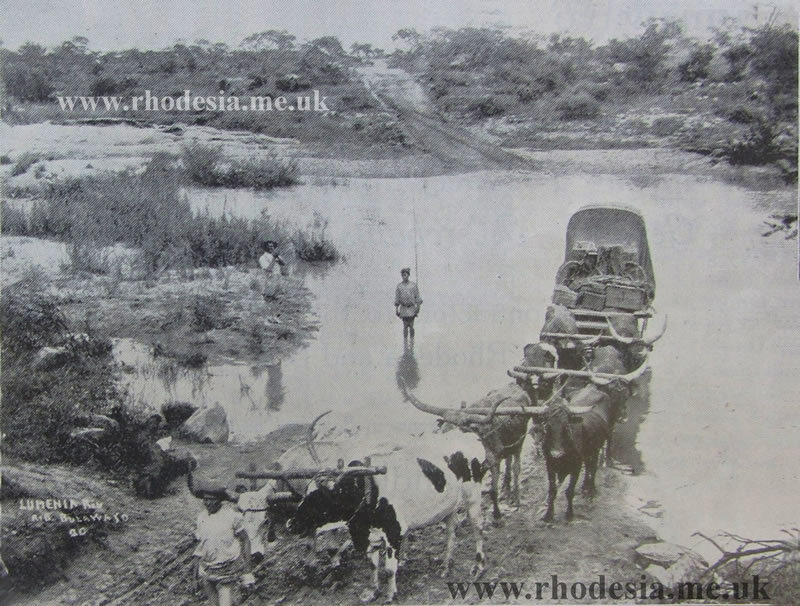 Before European settlement there were no roads, bridges, railways or any other aid to getting about what was to become Rhodesia. There were merely tracks made by wild animals and natives on foot, of whom just a few hundred thousand of the latter were scattered about the country in small communities. Before the arrival of the white man they had not yet discovered or made use of the wheel. In the early days of settlement travelling to Rhodesia and within the country was painfully slow. For personal transport, the horse was the fastest means of travel but transport waggons were generally pulled by oxen which, by then, had been well tried and tested by the Boer / Afrikaner community in South Africa for well over two hundred years. They were extremely hardy and very strong but moved at a very slow pace. The following is taken from a contemporary guide to procurement and operation of trek waggons such as were used to open up the new country which became Rhodesia. Prices are quoted as they were in the 1890s. ~ The healthiest season of the year in which to travel is during the winter months from May to November inclusive when little or no rain falls, whereas during the wet summer months fever is very prevalent in most of the low lying districts. Arrangements may be made with some transport rider proceeding in the required direction, who usually allows about 50 lbs. of baggage free and charges current rates per 100 lbs. for anything extra, in accordance with the country to be passed through, the demand, etc. The commissariat must be provided for independently and it is generally wise to take a sufficiency of provisions from the starting point. The prices asked always vary very considerably and are generally heaviest during the dry season, when waggons are mostly fully employed. Travellers by wagon must be prepared to sleep out in the open. During the rainy season, delays may be indefinite should the rivers rise, the oxen die, or other misfortunes happen. Again, during the dry season, want of pasture is sometimes a hindrance. Those with a large amount of baggage may prefer to purchase a wagon and oxen and re-sell on arrival at their destination. It is advisable to move slowly, but steadily, no stoppages for rest being made unless absolutely necessary. The outfit necessary for a long trip includes a tent wagon and team of 12 to 16 oxen, costing altogether from £180 to £300. These waggons are colonial made, without springs, covered in with canvas and exceedingly strong. The woods employed are also principally of Colonial growth. A new wagon costs from £65 – £100, waggon gear for 16 oxen costs from £20 – £30, and, it is as well, unless travelling through a populous district, to take 4 spare oxen. It is usual to employ a team of from 16 to 18 trek-oxen. Draught oxen naturally vary greatly in price; typically from £5 to £20 each. A wagon drawn by 16 oxen, when the ground is not too soft, can carry a load of about 8000 lbs. at the rate of about 2 miles per hour. Drawn by 10 mules, the load should not exceed 3000 lbs. Drawn by a team of donkeys, the pace is very slow and the load must be much less. Taking it all round, oxen are to be preferred. Taking one day with another, on ordinary roads oxen will not cover much more than fifteen miles, but when roads are heavy and oxen poor it is often hard work to do more than five – a good average being about 100 miles a week. During the rainy season the rivers, mud-holes, etc., may cause delay, but less time is lost in looking for pasture, and, generally speaking, progress made is about the same as when it is dry. Oxen driven when wet from rain will gall their necks. To the south of the Limpopo the climate allows of oxen passing freely through almost any part of the country. 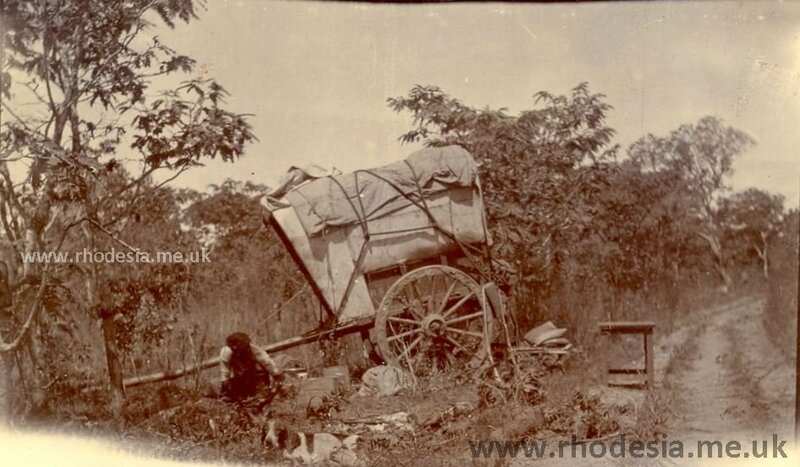 The same may be said of most parts of Rhodesia, though here the occasional presence of tsetse fly and the nature of the country act as a hindrance in certain localities; whilst beyond the Zambezi the waggon is greatly handicapped and it is well to rely upon other means of progression. A special pattern of waggons, made for up-country trips, with an extra breadth over the wheels and with lockers for provisions etc., are far more commodious than the ordinary tent waggon, in which sleeping accommodation is decidedly limited. The canvas in the fore-part should be protected by tanned leather or by some substance that cannot easily be torn by branches or thorns. Where raw hides are used for this purpose the smell during rainy weather is sometimes most objectionable. Folding stools must be included and, although a folding table may sound sybaritic, it is easily lashed to the side of the wagon and will be duly appreciated by anyone who has experienced the misery of constantly eating doubled up with the plate on his knees. Any Waggon builder, however, will, if requested, so arrange the interior that eating outside becomes unnecessary. The extra expense is small. Waggons should not be loaded to much more than half full when starting out. The traveller must also bear in mind that, although it will be of the greatest inconvenience to overload the wagon, at the same time his wagon is to be his home for at least some months, during the greater part of which he will be unable to purchase anything whatever. His baggage must, therefore, be limited to necessaries, but nothing necessary must be left behind. Parties will do well to forward a portion of their outfit to stations along the route they intend to follow. Two boys, as the natives are invariably called, are required to look after the oxen. The first, the driver, receiving about £4 per month, carries the whip, an instrument with a handle 12 ft. and lash 20 ft. long, used with both hands after the manner of a rod in fly-fishing and terribly punishing in the hands of an expert, but apt to curl painfully round the person of the amateur. On a heavy road the driver runs alongside the oxen, urging them on with yells, accentuated with lashes from his enormous whip, which falls on their hides with cracks like pistol shots. A thick heavy sjambok of hippopotamus hide is also carried for the benefit of the “achter osse” or wheelers. These, with the span in front of them, being well within reach, come in for the most generous share of encouragement. The second boy, who is often literally a lad, receives about 30s. per month and is known as the “voor-looper” or fore-runner, his duty being to lead the front span of oxen by means of a leather rein attached to their horns when there is any chance of their straying off the road. Occasionally, when the driver’s throat has temporarily succumbed to gutturals unapproachable by an Englishman, the voor-looper takes a turn at the whip and shouting. He has also to keep an eye on the oxen when gazing to prevent their wandering. It is also advisable to take at least one more boy to see to the cooking, beds etc. Any others that may be required are best picked up en route, as they then know the country and can serve as guides. Rations for natives should consist of 1 lb. meal; 1 lb. meat; 1 oz. coffee; 2 ozs. sugar and ½ oz. salt per diem. Cape-carts with springs and hoods, built to hold four persons, cost from £65-£85 each. Scotch-carts cost £40-£45 each. A Cape-cart is a most serviceable conveyance, can be drawn by two or four animals, is light and commodious and rarely upsets. A horse for each white member of the party will also be required, except in the fly country where they cannot be used. These should not cost more than £15 a-piece as they will not be wanted for show. If the trip is to be extended beyond the winter months “salted” horses, viz. those that have been attacked by and recovered from the horse-sickness, should be bought as others will certainly succumb to this disease. The price of salted horses is much higher, ranging from £35 to £100, but comparative immunity from a recurrence of the sickness renders them worth the money. Mules in South Africa usually cost a little more than horses. They can carry about 16 lbs. each and should cover about 3½ miles an hour. Mules stand the bite of the tsetse fly slightly better than horses. Donkeys are less subject to horse-sickness, and more impervious to the bite of the tsetse fly than any other animals. They can carry about 100 lbs. each at the rate of about 2½ miles an hour. The choice of guns is a difficult thing on which to advise and must mainly depend on the nature and size of the game which may be met with. The Boers as a rule use nothing but the military pattern Martini-Henri rifle for every kind of game but the elephant, and consequently, unless far away from any centre, ammunition for this rifle can always be obtained. The Boers frequently keep the old cases and refill them, but if this be done care must be taken to push the detonator right home, as fatal accidents have occurred through the block in rising exploding the cartridge. It could take three months by ox waggon to travel from Kimberley to Salisbury. The railway from the Cape reached Bulawayo in 1897, Salisbury in 1902 and Victoria Falls on the Zambezi in 1904. Feeder lines were constructed from the main lines and by 1914 Fort Victoria became one of the last centres to be connected. However, even after this, waggons remained the sole way to transport produce to the railheads until such time as adequate roads and bridges had been constructed. And this really only started to happen after World War I and especially after Rhodesia became self-governing in 1923. The Salisbury Steam Wagon and Carriage Manufacturing and Engineering Works of A.H. Hobbs. This photo by Strachan & Co was published in 1912 and shows an order for 16 Scotch Carts just completed. Originally a blacksmith and farrier the firm supplied all types of wagon material. The telegraph office on the south side of Manica Road can be seen on the extreme right of the picture which indicates that the works were probably located in Speke Ave. By 1930 stands 529 and 530 on the corner of Speke and Angwa were owned by motor distributors Puzey & Payne; so it seems both possible and logical that they later acquired the business of Mr Hobbs. See also In The Beginning, an account by Peter Hardwicke of his family’s trek to Rhodesia in the early 1890s.